You may not have heard of noodle harassment, but it's ruining the dinners and late-night snacks of innocent ramen-eaters the world over, apparently. 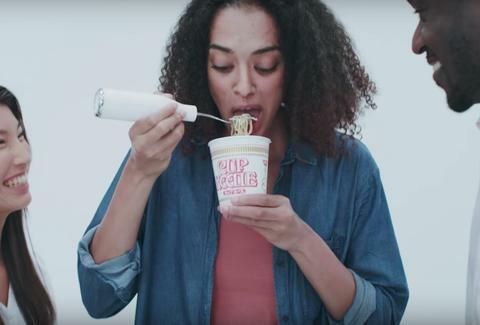 Noodle harassment is essentially being shamed for the decibel level of your noodle slurping, and one brave company is finally taking a stand against it. Nissin, maker of the beloved Cup Noodles, has painstakingly designed, crafted, and now released the most high-tech fork in the history of cutlery. The state-of-the-art utensil, which resembles an electric toothbrush, features a directional mic that identifies the oh-so-distinct sound of slurping and triggers your smartphone to play a selection of noises that include a whooshing sound and a xylophone. The promotional video released by the company sets the stage pretty well and depicts the near existential discomfort that comes from being a proud noodle-slurper in a crowd of meek noodle-consumers. Just to be clear in case you think this is an elaborate ruse: We cannot stress enough how real this product is and that you can use your non-Monopoly money to own it and use with your personal smartphone to mutely consume affordable, spicy noodles under the blissful cover of a whoosh. James Chrisman is a News Writer at Thrillist who slurps his noodles discreetly. Send news tips to news@thrillist.com and follow him on Twitter @james_chrisman2.